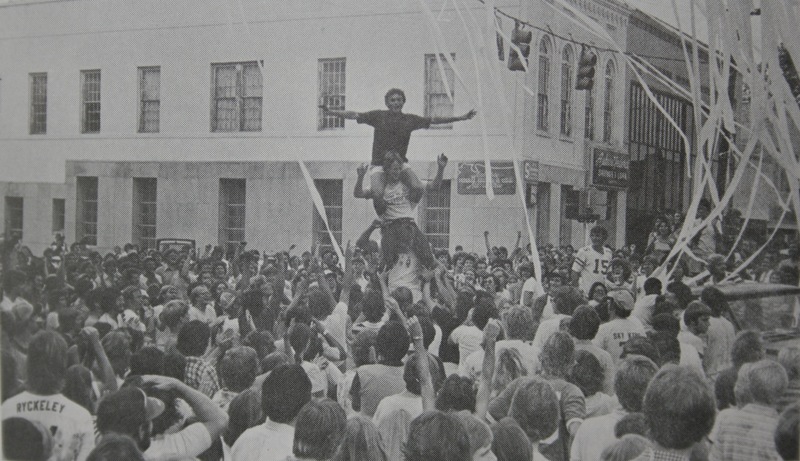 Fear of a Toomer’s apocalypse is nothing new. In 1978, folks worried that downtown renovations would Updyke the tradition of rolling Toomer’s Corner to extinction (they’re taking away our power lines. What are we going to roll, the oaks or something?) So folks started having fun while the funnin’ was good. They rolled cops. And they got on each others’ shoulders. *Sure, technically not a pyramid, but what are we supposed to call it? And maybe they were working on a pyramid. Photo from the 1978-79 Tiger Cub. Wow, that is 4 persons high! No way modern police allow that to happen. lol “You’ll hurt yourself! [Wahh.. Wahh…]” or something similarly annoying. That’s pretty awesome, though! We have found our attractive intersection structure to roll until the Toomer’s Oaks are healthy again. They could even run around for an added challenge.